Ok a bit of history/background of the UAE. There are 7 emirates, similar to provinces in SA. They are Abu Dhabi, Dubai, Sharjah, Umm Al Quwain, Ajman, Ras Al Khaimah and Fujairah. At first they were governed by themselves but in 1971 Sheikh Zayed worked his charm and the United Arab Emirates were born. National day is on the 2nd of December. There is even a 2nd December Street in Dubai. Abu Dhabi is the capital and not Dubai as a lot of people assume. 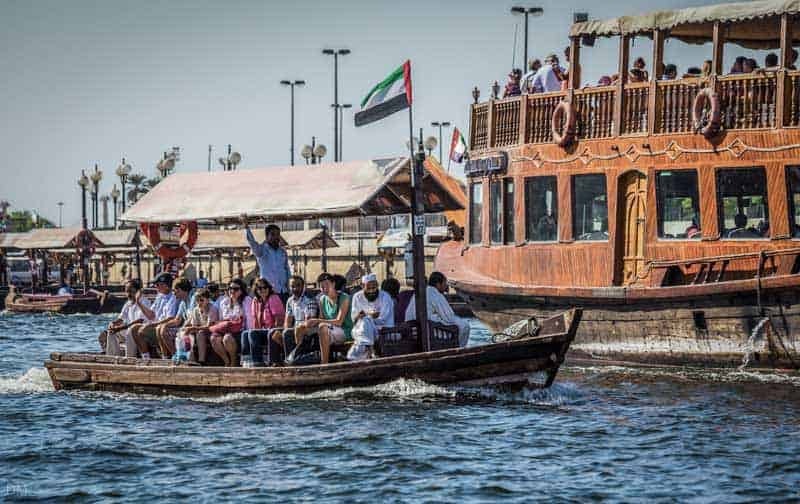 Dubai is divided by the Creek which is a natural seawater inlet that end into a wetland that is home to lots of feathery friends, migratory birds and mangrove trees. The Northern part is called Deira and the Southern part is Bur Dubai. Deira is known more as the old part and Bur Dubai the new part. Bur Dubai is also where most of the new developments are happening. Yes the public transport is top notch here. The whole of Dubai is covered by Metro, Tram, Taxi, Bus, Abbra and Water Taxis. I take the bus then the Metro to and from work every day and it cost me 6AED per day, that’s about ZAR22. The moment a taxi come into play it becomes rather expensive, albeit a bit quicker. The Abbras are old fashioned boats with a diesel engine that take you from Bur Dubai to Deira and back across the Creek. Following pics stolen from the WWW. The Water Taxis are mostly for sightseeing and focus on the tourists. I still need to go catch a ride with them. The Tram is a 14km 11 station affair that is not a true tram per se, as the tram does not share the road with other road users apart from crossing the road. The tram does have a driver whereas the Metro is automated, which begs the question, if the metro is automated why does it have headlights and windscreen wipers? This is Bur Juman station and who would have thought that half inflated condoms could be used as chandeliers? The Arabs like their numbers. This is a clock displayed at one of the stations. Great thread thanx! I miss living there very much!! I think flying is amazing and I was from a very young age intrigued by it, so much so that I have constructed many projects on airports here in the UAE. I have worked for a Joint Venture in Abu Dhabi where we were constructing the new terminal at the Abu Dhabi International Airport. Here is a little background on the project. The terminal is located in the Emirate of Abu Dhabi, which is the capital of the UAE, between the 2 runways of the existing airport. The building comprises of a central processor with four piers, which house the Rotundas or Gate Houses from where you board the planes. The foot print remind me of a grotesque 4 legged spider or even a dead person lying face down. There are 49 Rotundas spread around the 4 Piers and the terminal is designed to handle 30 million passengers per year. Each Pier have its own particular colour and design schemes. The main building faces West with Pier 1 pointing towards the sea, Pier 2 towards an oasis (Al Ain), Pier 3 towards the desert and Pier 4 towards the city of Abu Dhabi. An artist’s impression with Pier 1, front left and clockwise Piers 2, 3 and 4. The colour scheme of Pier 4 have since been changed from the dark red to a more subtle purple-ish colour. The different designs. Artist impression how the departure hall will look like. The 2 brown monsters in the background is on the left a hotel and office block on the right. This is the office block. Clad with glass and then to give more privacy covered with metal louvres. I don’t like it. The central processor feature 18 steel arches serving both as support for the roof and as architectural features in the building covered with 19300 Aluminium Composite Panels. The biggest arch to the front of the building is about 50 metres above floor level at its highest point. Due to accessibility the panels were installed by means of rope access at first. 8 different types of natural stone will be used for the floors and walls to the tune of about 245000m². The stone comes from India, Brazil and to my astonishment from my home country Namibia, albeit only about 7000m² out of the total quantity. The exotic colours are just for illustrative purposes as it is difficult to replicate the exact same colours on a PC. The blue represent the Namibian stone. The below drawing is for the arrivals level only and to show you the general pattern followed throughout the building. What is the lifestyle there like? Is it in alright place to live? How do they treat western women? Yes it is a good place to live, it can be expensive though. Treatment of any women is good and you can work, drive, wear what you want as long its not too revealing etc. Where do you live? How does cost compare to SA? Food? Drink? Availability? Things you should never do there? Like in Thailand where it is forbidden for instance to greet and talk to the monks? I work and live in Dubai. The problem is trying to compare UAE things to SA things. First as a SA visitor it is expensive as the ZAR is almost 4 to 1 Dirham. The second is I earn Dirhams and spend it here so the moment you compare it to the ZAR its either expensive for you or cheap for me. You can buy alcoholic drinks at the bottle store but need to have a license and you pay super tax on the drink. Or you can buy when entering Dubai at the duty free shops without a license. Basically all the hotels serve alcohol, so no probs for who want a drink. In the neighboring Emirates like Ajman or Umm Al Quwain you can buy drinks without having a license. Any type of food always available, pork items in selected stores only. Meat from Brazil, Aus, New Zealand, UK and SA. Don't ever drive under the influence, when you are caught you WILL go to jail and get a hefty fine can be like 20000Dirhams! Don't flick someone the bird. Don't say anything derogatory about the government or their leaders. The heat is not my biggest problem but the humidity is the killer. Summer can be like 45 - 48 degrees C with humidity of 70% and up. Weekends lots of stuff to do or experience like bike riding, camping in the desert in winter, sight seeing, skydiving, hot air ballooning, scuba diving, you name it you can do it. Someone had the time to figure this out that the nuclear aircraft carrier Nimitz footprint fit snugly into that part of the building, if it is correct I don't know but looks good here. All the ceilings for the whole building is about 480000m². 5435 total doors in the building of which 4706 is hollow metal doors, 659 glass doors and 70 roller shutters doors. There are 96 vertical cables and 64 horizontal cables. The horizontals intersect every vertical crossing. At this crossing point a stainless steel node join all the 4 cables together to form the mesh. To complete the structure 1632 glass panels are attached to the mesh. All will be revealed ….. after I get back from holiday in 4 weeks time. Nah just joking....no leave for me. This is the view from the Arrivals level. The drawing above is a little outdated as the centre spine is not sticking out at the bottom. Just want to let you see the dimensions of this small vase. The spine supports the top ring, the top ring supports the cables, the cables support the glass. But what supports the spine if it does not hang on the bottom ring?